Do you shop on Amazon.com? Well, if you do, you now have the opportunity to support St. John’s just by shopping at Amazon using AmazonSmile. Amazon will donate 0.5 percent of the price of your eligible AmazonSmile purchases to St. John's Lutheran Church whenever you shop on AmazonSmile. Please note: When you login, you will be prompted to re-enter your password and type the characters you see in the image created by Amazon. This will occur every time you log in (remaining logged into your Amazon account is not recommended for security purposes). By doing this, you will continue to shop at the same Amazon you love, but you will enter the site through a different link. Each time you shop Amazon, just access your account by entering: https://smile.amazon.com/ch/54-6045960 in your browser (or you can save this page as a bookmark or favorite depending on the web browser you use) and you will automatically be connected with SJ as your chosen charity. Thank you for your support! Now, there's an easier way to use AmazonSmile. It's called Smilematic which is a simple browser extension that anyone can install for free, and from that point on all your Amazon shopping experiences will automatically direct you so that you go through AmazonSmile. Smilematic will work with the following browsers: Chrome, Firefox and Safari. If you shop using the Amazon app on your smartphone, Amazon is in the process of developing an app version of Smilematic. If you're curious about the how's and why's of Smilematic, here's an FAQ. Click on the graphic below. 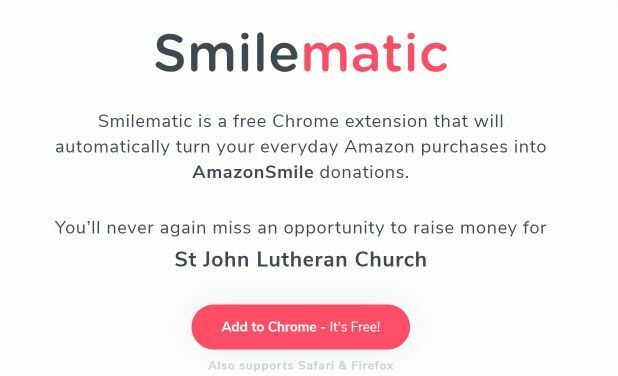 If you're ready to install Smilematic, click on the graphic below and you'll be directed to the site where you can download and install the extension specific to St. John's Lutheran Church.